The program is open to athletes K - 6th grade. Track athletes participate with their age group. Registration closes on Feb 26th. 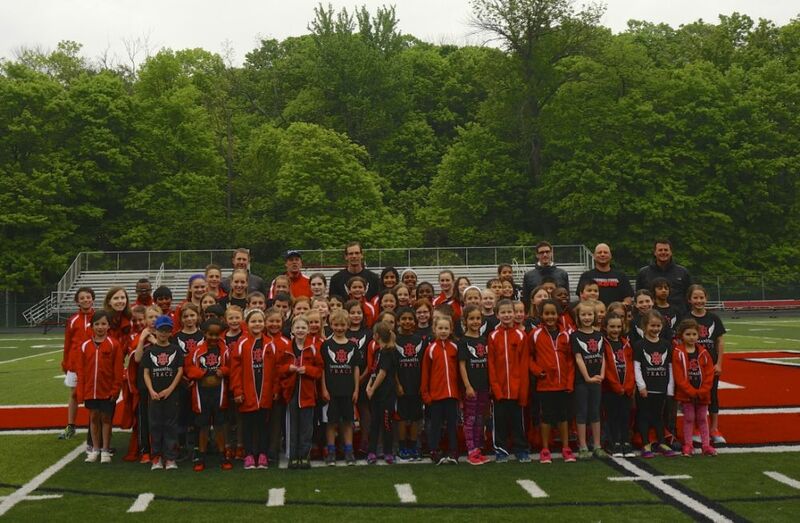 The Track Program does allow athletes who are participating in other Spring sports to participate in the Track Program provided parents communicate with the program director about scheduling conflicts in advance of practices and meets. Each athlete will receive a team shirt and a team warm-up jacket and be entered in six multi-team invitational track meets which will take place on Saturdays starting in April with the final Meet held in May. Most practices will be held at the Indian Hill High School Track on 2 nights per week. Other practices are typically held at Cincinnati Country Day, less than 1 mile away. Track Meets are invitationals (mostly with Catholic Youth Organization schools), usually held on Saturdays at high school tracks in the Cincinnati area. The current meet schedule begins Saturday, April 6 and concludes with the City Championship Meet on Saturday, May 18. Grade K thru 4 run in heats (based on gender and grade) and each runner receives a ribbon for his/her place in the heat. For grades 5 & 6, the top 6 finishers in each event receive an award. Each runner is entered in 3 events, usually two running events and one field event. Generally at the meets, boys do field events first, then running events. Girls do running events, then field events. Parent volunteers are needed to assist at practices, and to lead the K-2 and 5-6 grade meets. NO SPECIAL TRAINING IS REQUIRED TO ASSIST. Parents are asked to volunteer as needed at meets. We will focus on overall fitness, technique, individual improvement and fun! If there is a team on the track or field before us please respect their time and wait to enter the facility until they have completed their practice. This is for everyone’s safety. A positive attitude and attention skills. We ask that every athlete gives their best performance no matter their speed or experience. We are all working to get better every day. Important – if we receive unexpected lightning or thunder please plan to pick up your child or to stay near the track. Available safe shelter is limited at our facilities so please monitor. Weather cancellation information – Due to above, I will try to make any cancellation decisions by 4:00PM on the day of practice. This decision will often be based on weather that is not yet in the area, but we will always err on the side of safety for our team and coaches. Cancellations will be communicated via the IH Rec Sports notification system. There will be hundreds of athletes and many more parents and volunteers at the meets so please do not plan to drop off your child at the meets. Our coaches will be available to help guide our team to their events, but it is not possible to keep track of all of our athletes, you may need to assist your child. Arrive early for check in and warm up, especially for the first few meets. Parking can be challenging! Most tracks will charge a small admission fee for spectators (athletes are free). Uniforms – each athlete will have an Indian Hill Track shirt and sweatshirt to wear. Please wear this to every meet and make sure that it is visible during the meet. Please do not wear a uniform from prior years. Meet Etiquette – meet organizers are typically volunteers that are giving their time to help support youth athletics. Please be patient with them and respect any special instructions such as staying off athletic fields or mats. We are often guests at the tracks and want to represent Indian Hill well. Meet Weather – Meets will generally take place unless there is threatening weather. Meets will typically be delayed if possible, with everyone being brought inside until the area is lightning free for 30 minutes. The CYO Provides updated meet information at the following number: 513-395-8555. This is where I will get my information, but if a delay/cancellation occurs during the meet I will not be able to provide an email notification. Please plan to check this directly if there is a weather question. Athletes will participate in 3 events (usually 1 field and 2 track events). Relay teams will be assigned at the meet – if you are interested let the coach know. Ribbons will be awarded for all participants based on place in each individual heat. If you feel that your child received the wrong ribbon please ask a meet volunteer or coach to help – they will typically accommodate the request without problem. Athletes must let the Indian Hill coach know by Tuesday prior to the meet of their preferred events. All athletes will be pre-registered with seeding in specific lanes and race heats. Coaches will generally accommodate requests but may shift events if participants are needed or to support relays. Modifications cannot be made on the date of the meet. It is important to let me know if you cannot attend a meet in order to ensure we have sufficient coverage for relays. Medals will be awarded for the top 6 places in each event, and times will be recorded. Dual Meet – we will try to schedule a dual meet with Mariemont during the season. This meet has typically been during one of our practice times and is much more relaxed. Stay tuned for more info. End of Season Banquet – we will have an end of season banquet and awards ceremony to celebrate the team’s season. We have tentatively scheduled this for Monday, May 20 – please save the date.